This experimental non-fiction video explores the malleability of objects and occupied space. Cardboard boxes, garbage bags and handbags all have conventional roles in our society. At Midtown Bags and Wallets, they all take on unusual functions. 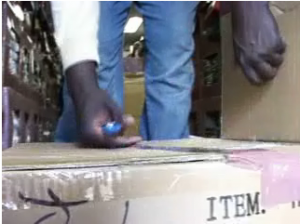 Sealed cardboard boxes are carried inside and cut open. Handbags covered with clear plastic bags are removed, and put into reconfigured taped-cardboard box shelves. The handbags come out of this makeshift shelving, get counted and priced as they are dumped into large garbage bags, and then are put in sheared- off cardboard boxes, placed on a dolly and taken off into the streets to be sold. Space is easily transformable. Plastic bags go from being flat on a roll and occupying space, to opening and becoming a space with the capacity to hold items. Boxes mutate in shape and function. The leftover boxes are broken down, no longer a space unto themselves, and are put into the cellar, going from being a space to becoming an item using a space. The ultimate use of a handbag is as a space to hold personal items while traveling from one place to another. They are more resilient than cardboard, and are more of a permanent fixture than a cardboard box. Yet here, the handbags themselves are the items being held by a temporary holding space. They are inside clear plastic bags, and go between boxes and garbage bags on their way to becoming someone’s personal space for carrying other objects.